Ring News 24Boxing NewsCletus Seldin Victorious In Star-Making HBO Performance Saturday Night! Long Island’s CLETUS “THE HEBREW HAMMER” SELDIN improved to 21-0 with 17 knockouts, with an outstanding third round knockout of ROBERTO “MASSA” ORTIZ, (now 35-2-2, 28 KO’s) on Saturday night at NYCB LIVE, home of the Nassau Veterans Memorial Coliseum in Uniondale, New York. As soon as the fight started, Seldin pursued Ortiz with his typical relentless style. Seldin dropped Ortiz twice in the opening round. The first knockdown was the result of a thunderous right hand that landed on the temple. Seldin continued attacking Ortiz in his crowd pleasing tenacious style throughout the round and fight. 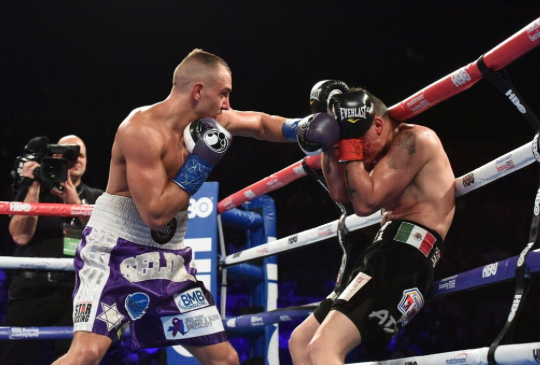 Opening up a huge cut over Ortiz left eye with a massive right cross in the second round, Seldin earned the stoppage with a barrage of power punches in the third stanza as referee Shada Murdaugh called a halt to the carnage (2:43) of the scheduled 10-round junior welterweight bout. “My fans have been seeing me do this for the last couple of years at The Paramount on Long Island. I’m thrilled we were able to do this at the Coliseum and on HBO. I can’t wait to fight here again where we can fill the place with the ‘Hamma Heads'”. Cletus Seldin’s performance was tremendous and electrified the crowd, many of whom were the “Hamma Head” fans that were seen tailgating in the Nassau Coliseum parking lot before the event. Fans, media and HBO commentators were overwhelmingly impressed with the punching power and refreshing style of Seldin, which is truly unique and pleasing to watch. Undefeated, Long Island welterweight prospect TYRONE “PRETTY BOY” JAMES, also performed under the bright lights of the Nassau Coliseum by decisively winning his 6-round bout against veteran DANIEL SOSTRE. After dropping Sostre in the first round, James cruised to a victory as he utilized his height and length to create space, letting his hands do the rest. James improves to 6-0 3KOs. The fight card at NYCB LIVE brought exciting fights to the Long Island fans all night. In the co-feature heavyweight showdown, JARRELL MILLER earned a TKO in the 9th round, earning a victory over 6’8″ MARIUSZ WACH. In the main event, Brooklyn’s DANIEL JACOBS decisively took down LUIS ARIAS to earn his 33rd career win.